As you may already know, ABetterRouteplanner.com collects driving data from contributing users. This data is used to improve the ABRP car models (i.e. the mathematical representation of each type of car) and also, to give back to the ABRP community providing the data, to be published here in the blog! 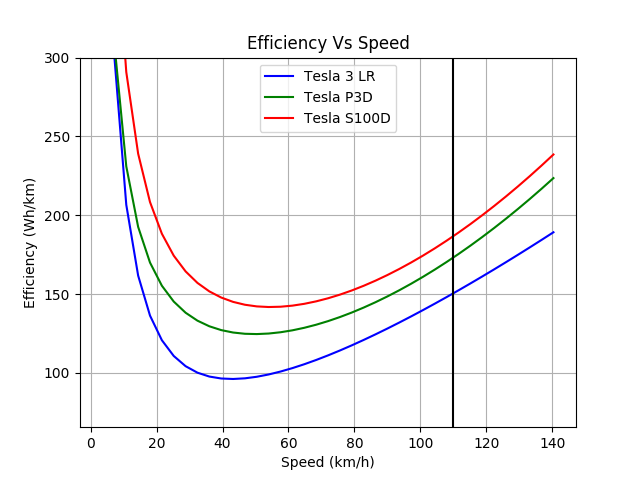 At this point, we have received a lot of Model 3 Long Range driving data, and even enough data from Model 3 Performance to draw some first conclusions on how they differ. We have 220 different Model 3 Long Range users who have contributed a total of 70,000 km (43,000 miles) of driving, which caters for very good data. Most of these Model 3 Long Range are the RWD version. For P3D, there is "only" 13 cars contributing so far, having driven around 7,000 km (4,300 miles) of driving, which means that statistics is a little bit more shaky, but still usable. 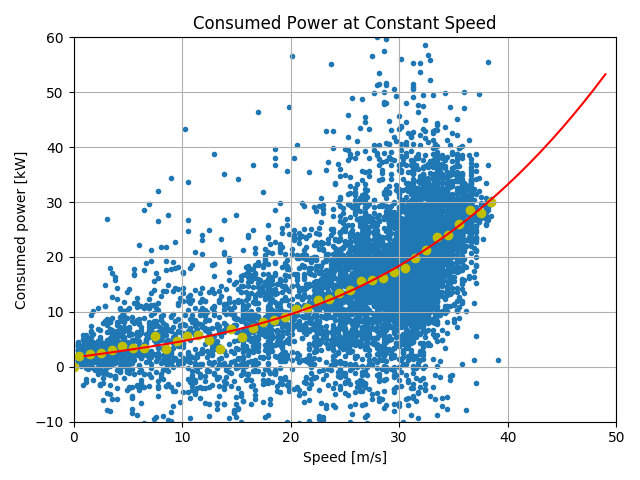 Just to show off what those numbers mean, this is the graph of the 7,000 km of P3D data - every blue point corresponds to 30 seconds of driving at a certain speed and how much power that car has consumed during those 30 seconds. 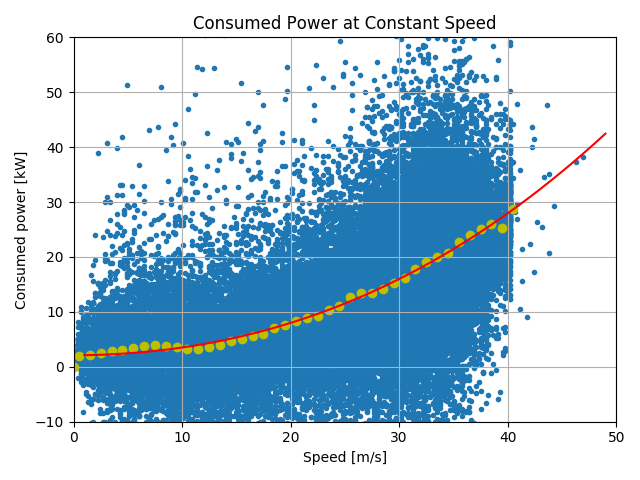 Yellow dots show the median power consumption for that speed and red line is our fitted model. This means that our real-world driving data shows that the P3D consumes about 15% more than the RWD version at highway speeds. This is expected, or actually somewhat low - most P3Ds run on 20" sports wheels instead of 18" Aeros, and perhaps more importantly, P3Ds may be driven more like performance cars by their drivers. Tesla Model 3 Long Range: Total trip time 09:44, of which charging 01:24. Tesla Model P3D: Total trip time 09:59 of which charging 01:39. Tesla Model S100D: Total trip time 10:05 of which charging 01:45. So the slightly higher consumption in a P3D does equate to 15 minutes more charging time in a 1,000 km road trip. Not too shabby! I suspect that someone accidentally swapped the numbers in the summary after the first graph: 173Wh/km @110kph is 278Wh/mi @68mph. Similarly, 150Wh/km @110kph is 241Wh/mi @68mph. 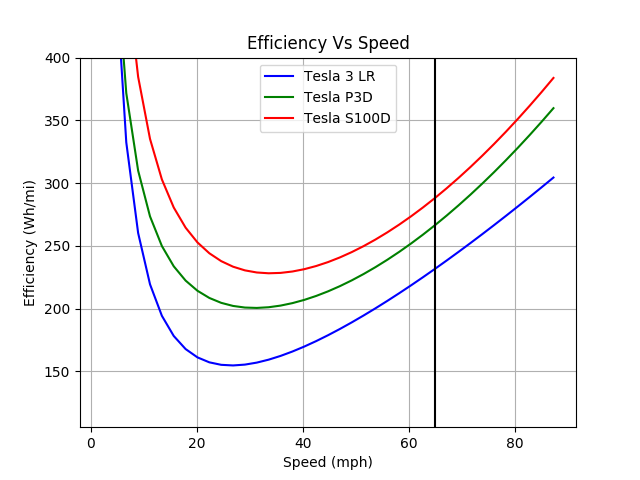 This makes the 232Wh/mi @65mph for the P3D unlikely; I don't think the efficiency of the LR RWD car drops from 241Wh/mi @68mph to 267Wh/mi @65mph. Also, 110kph is 68mph, not 65mph. Something definitely wrong wife my P3D getting consistently over 310 Kw/H at 70mph. 310 Wh/km or 310 Wh/mi? Depending on temperature, 310 Wh/mi is perfectly reasonable for a P3D. Thanks for the catch, the imperial unit efficiency numbers were switched. Now fixed! The issue with Model 3 specifically is that the option codes reported by the MyTesla API are broken - they are all the same for any Model 3. This means that we have to trust what the user chooses in ABRP as car model, and this is quite often not completely correct. Also, we have, so far been lacking a choice for AWD. Will fix that soon! You should probably include some data as to what weather this data was collected in, since it makes such a huge difference. I'd love to break it down more, but the issue is that Model 3s all report exactly the same option codes through the API, so I can only use what the owners select as car model. We recently included specific AWD 18- and 19-inch wheel models so hopefully this will enable us to look at the differences between AWD and non-AWD too. We do log outside temperature; we'll look at that once winter is coming (in the northern hemisphere). Otherwise, the median filtering we do at each speed means that the curve we get is for the most common weather and driving - likely nice dry summer driving since the data is mostly from the summer and early fall. What total capacity are you using for long-range Model 3's? Using the rated consumption and rated km's, I show only ~70 kWh in my new Model 3, but interpolating from your graph above, it appears you are using 75 kWh. 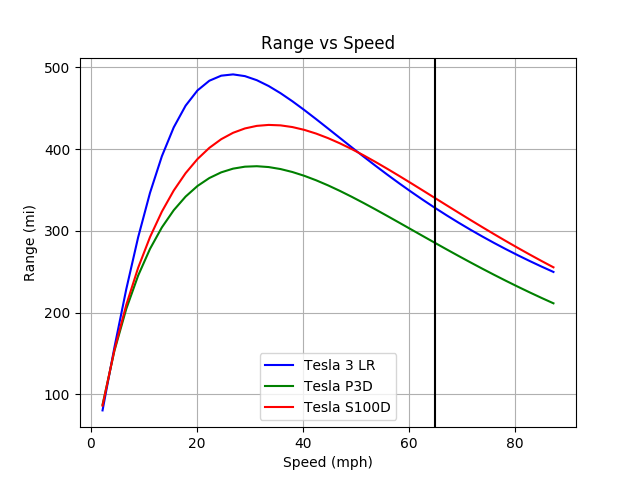 Does the model use 75 or 70?What total capacity are you using for long-range Model 3's? Using the rated consumption and rated km's, I show only ~70 kWh in my new Model 3, but interpolating from your graph above, it appears you are using 75 kWh. Does the model use 75 or 70? 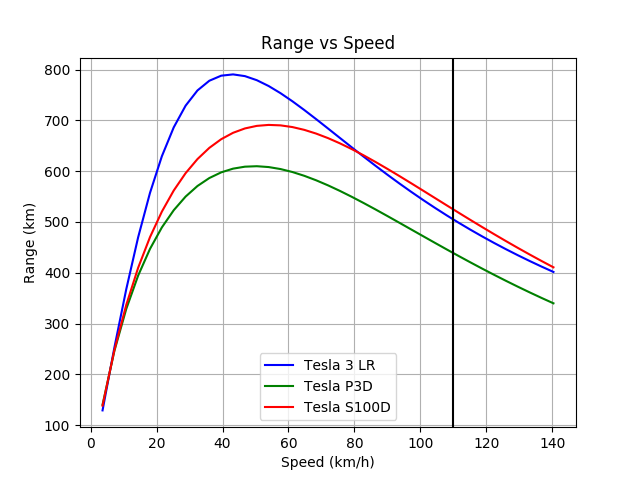 Is the last graph "Consumed power at constant speed" for the model 3 long range rear wheel drive?